Anaerobic digestion is a well-proven and widely popular organic waste management technology having multiple environmental, energy, economic and social benefits. Anaerobic digestion (also known as AD) is the natural biological process which stabilizes organic waste in the absence of air and transforms it into biofertilizer and biogas. It is a reliable technology for the treatment of wet, organic waste. Organic waste from various sources is biochemically degraded in highly controlled, oxygen-free conditions circumstances resulting in the production of biogas which can be used to produce both electricity and heat. Almost any organic material can be processed with anaerobic digestion. Anaerobic digestion is particularly suited to wet organic material and is commonly used for industrial effluent and municipal sewage treatment. This includes biodegradable waste materials such as waste paper, grass clippings, food waste, sewage, agricultural wastes and animal waste. The exception to this is woody wastes that are largely unaffected by digestion as most anaerobic microorganisms are unable to degrade lignin. Reduced dependence on inorganic fertilizers by capture and reuse of nutrients. Protection of groundwater and surface water resources. Anaerobic digestion is a net energy-producing process. A biogas facility generates high-quality renewable fuel. Surplus energy as electricity and heat is produced during anaerobic digestion of biomass. Anaerobic digestion reduces reliance on energy imports. Such a facility contributes to decentralized, distributed power systems. Biogas is a rich source of electricity, heat, and transportation fuel. Anaerobic digestion transforms waste liabilities into new profit centers. The time devoted to moving, handling and processing manure is minimized. 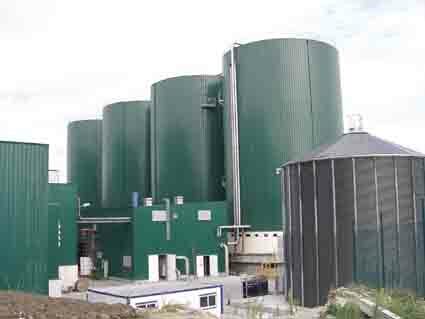 Anaerobic digestion adds value to negative value feedstock. Income can be obtained from the processing of waste (tipping fees), sale of organic fertilizer, carbon credits and sale of power. Power tax credits may be obtained from each kWh of power produced. A biomass-to-biogas facility reduces water consumption. It reduces dependence on energy imports. Anaerobic digestion plants increases self-sufficiency. I wish the world nations are ranked for their carbon credits to create awareness among people to opt for the production and use of bioenergy to cause purity of environment and economic empowerment.